I took down all my Christmas decorations on January 1st, ALL of it. It left me with a disturbingly empty room and almost sterile look that reminded me a bit too much of what happens each time we just move into a new flat. I kid you not, there was even a faint echo as I spoke in the room (ok yelled at the cat...). It felt way too odd to leave it like that more than a few hours, I HAD to do something about it. But you see, we get so consumed by the holiday season that we tend to forget that our homes deserve some TLC and pretty decor all year round, and if you Google "January decor" you are usually stuck between a glitzy New Year's Eve party decor or an avalanche of snowflakes. None of which is practical as a decor when you live in a tropical climate where the only marker of a season change is in how high the mercury climbs in the thermometer. In the end, I decided to go with a white and gold theme inspired by all the New Year party decor but with a more long lasting and practical take on it. The top of my Lhasa chest of drawer is the best place to create seasonal decor vignette in my home. 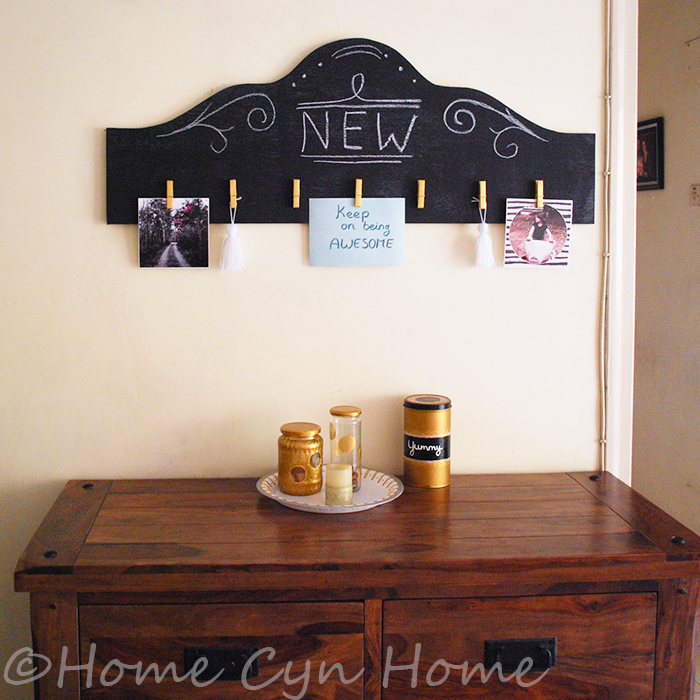 Especially now that it has the black board photo display I made a few months ago hanging above it. During the month of December it became the home to my cookie tins, and various Christmas-y decor elements. The thing is we aren't done eating and enjoying cookies (of any kind, the Swiss homemade ones are all gone). We enjoy them all Winter long, with a steaming cup of tea for companion. Those cookies just needed a new home and I am not going to lie, I totally got my inspiration from this candy jars blog post (it has convinced me to keep on hoarding collecting empty glass jars). I ended up only using two of them in that particular decor. 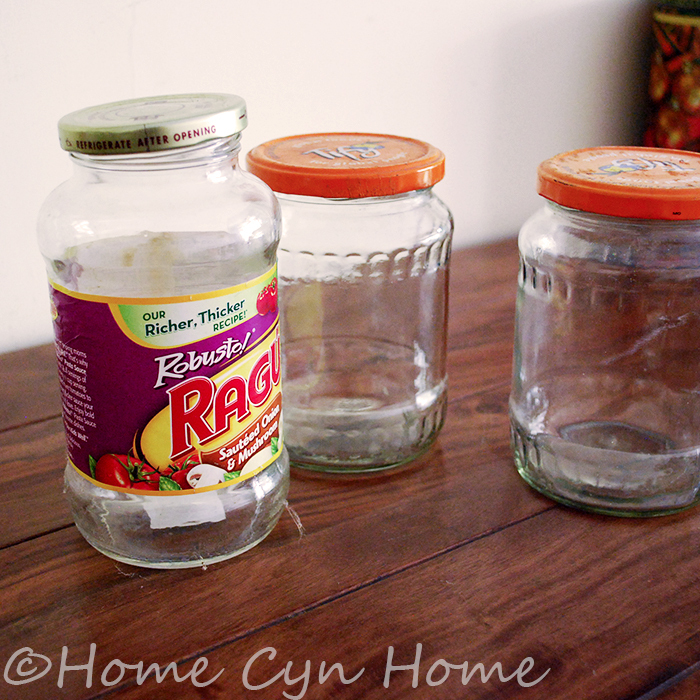 The Ragu jar still has ridiculously stubborn label glue on it that I didn't have the patience to tackle (I needed that decor fix FAST). The first thing I did, was spray paint all the lids with gold paint, and had a though time doing so as the brand of pain I used was a bit runny and didn't dry as quickly as I wanted. 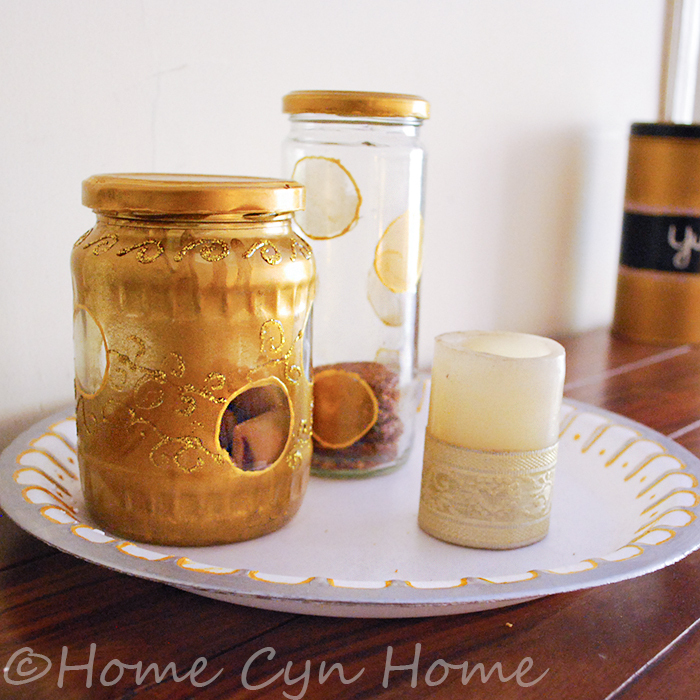 Then, I decided to spray paint the jars themselves using some stencils to make some cutout patterns on them. Again, the paint was a bit runny and I ended up having to clean up my design using some nail polish remover and my trusted 3D liner glue (and no, I haven't made the resolution to stop being so addicted to it, thank you very much). My two jars looked a bit "lost" on the top of that chest of drawer, and didn't make much of a statement on their own. What they needed was to be placed on an interesting tray. For a moment I considered spray painting one of my stainless steel plates, but remembered I use them in the kitchen regularly enough to bake pies and would miss them. So, I went for the next best thing : a Styrofoam disposable plate. I always keep a few of these around, for both party hosting and DIY projects. 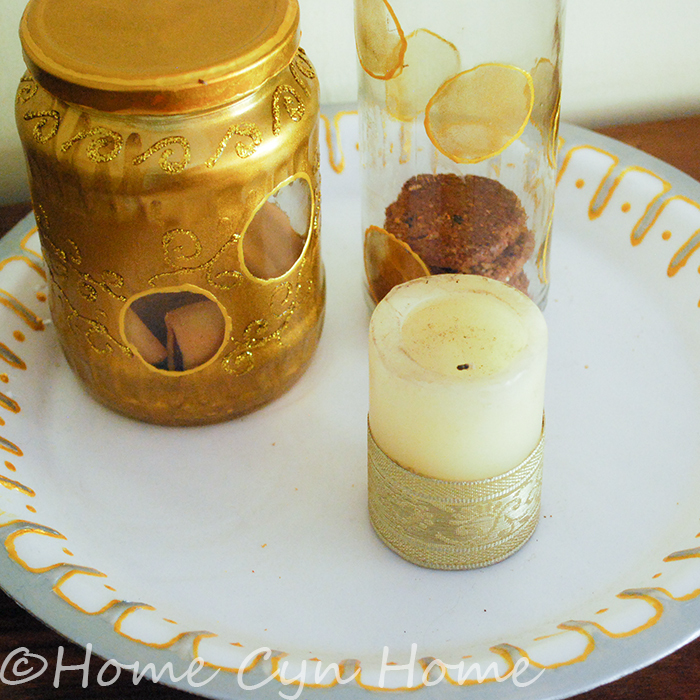 I painted the edge of said plate with silver acrylic paint and added some accents in 3D gold liner before placing my two jars and a candle on it. The cookies jar have been liberally raided by Ishita and her friends between the time I completed the project and the time I found to take a picture. This has become the perfect solution to Ishita's school break playdates hunger pangs. The answer to "Auntie do you have anything to eat" has become "Help yourself to some cookies over there". This is the first part of a series of January decor posts, as I have been busy making tassels (picture above as a proof), hanged some fairy lights, and still have a few ideas left to materialise. Hmm, I'm wondering how pretty those would be with a little white candle in them at night. Or would a candle melt the paint off? My eiderdown comforters I bought at Migros 35 years ago are just now starting to leak little puffs of itty bitty feathers. I think I paid like $400 for both of them. That was expensive back then but I think I got my money's worth! I don't think the paint would melt, this is heavy duty spray paint that is more often than not used to paint cars. I am amazed to hear those comforter lasted this long! That was indeed money well spent! Inspired by you, I did some creative stuff for home and have pictures to show you. My one question is what is this black thing made of ? The one on which you have paper clips on and "New" Written.